My Story EO 9066: What Does Day of Remembrance Mean to Me? You are at:Home»English»My Story EO 9066: What Does Day of Remembrance Mean to Me? 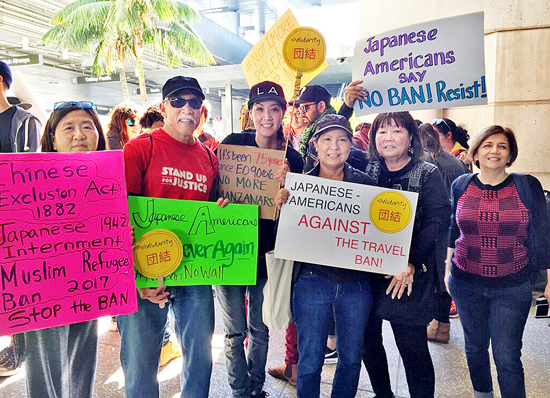 Steve Nagano and his daugher Kelsey Iino (center) took part in recent protests against the travel ban from seven predominately Muslim countries at LAX. Over a meal after demonstrating at the airport, my daughter asked, “Were there any protests when we (Japanese Americans) were put into camps? Did people do this when we were put into camps?” “No.” That was met with a disbelieving look, one that I took as how could freedom-loving American people NOT protest. Unfortunately today, EO 9066, 75 years ago, does not seem so far away. In fact, it is at our doorsteps, in our faces. Do we need a day of remembrance to remember how racist Americans have been? Do we need a day of remembrance to remember how our parents and grandparents were deprived of their basic rights, stripped of their dignity, removed from their property, their land, their homes, their communities? As a Japanese American, I wish I could say, “No, we don’t need a day of remembrance.” But we do! Not only to remember, but to stand up today for the similar acts perpetrated upon our fellow Americans! As a Japanese American I feel it is my responsibility, my duty to stand up against injustice, to not let what happened to my grandparents and parents, your grandparents, great-grandparents, uncles and aunts, cousins, mothers and fathers, happen again! “May it never happen again” is something we hear over and over and yet it has happened and today the scene is fertile for something like that to happen again. Yes, rights were stripped, the Constitution violated, property lost, but can we, those who were not incarcerated, feel the humiliation, the pain, the disillusionment, the betrayal, the sting of racist taunts, the uncertainty of our futures? (“Will they line us up against the wall and shoot us?” “Where are we going and will we ever come back?” “Will we ever get out of here?”) Can we empathize with the previous generations? DOR is time to take a moment to remember reflect on the struggles, humiliation, and loss, and to re-energize the continuing struggle for justice and equality. It is also a time to reflect upon what the Issei and Nisei sacrificed for us, the future generations, and to express our gratitude for all they have given us. We, the everyday people, are the makers of culture and we as Japanese Americans can influence what our culture is and becomes. What does it mean to be Japanese American…and not just defined by our history, or arts, or foods, but what do we stand for? Japanese America should stand up for what is right, stand up against injustice, stand up for the marginalized, for we, having experienced the concentration camps, know what it took from us. We should stand together because we know what happens when we stand apart. We should support others that are battered by the forces of racism because we have felt the pain, the humiliation, the suffering. We should fight injustice because we know its consequences first-hand. This should be our culture — our tradition, our habit, our way of living. My Stories E.O. 9066 is a series of stories on the continuing impact of Executive Order 9066 on the lives of Japanese Americans. Steve’s dad, Paul, is in his 90’s and lives in a retirement home in Pasadena. Rev. Nagano served as a young minister in Poston, as well as at the Evergreen Baptist Church post-war. A dvd featuring him, Bishop Roy Sano, Rev. John Miyabe and Rev. Sam Tonomura telling of their wartime experiences is available in a dvd which can be streamed. contact Phil Shigekuni at [email protected].